Hello guys,today i am here with tutorial to solve error 927 in play store. There are lots of errors in android device os. But one of the most famous error is error 927. It is related to play store. This error occurs when user tries to update or download application from play store.So today in this tutorial you will get solution of how to fix error 927 in android or play store. The methods which will be described here are easiest methods to solve error 927 in play store.These methods can be applied to any devices and it can be solved. So let's start our ways to fix error 927 in play store. Solve error 927 in play store. step 1 : In this method to solve error 927 in play store,first login it to using different gmail account.You can login it via system settings -> Accounts -> Remove gmail accounts. step 2 : Now force stop to play store and clear cache and all things. step 4 :And Now open play store and you can download new application finely . Step1 : Go to system application-> play store -> clear data and cache files. step:2 After clearing data and cache, force stop to the play store application. step 3: Open it again and download the apps. Step 4: This will work , if not then uninstall the updates of play store. It happens many times that user is not able to download the application via play store because of insufficient memory on device. In this case i will suggest you to check phone's memory for downloading application. If there is not any space then first make the space to download new application and then go to play store for downloading new application. 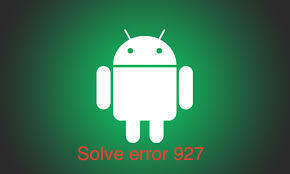 It will surely help you to solve error 927 in play store. So these all are the ways to solve error 927 in android device. These all are the methods via which you can fix the error 927 in play store. If you yet found any difficulty then comment here , i will help you to solve.